Kansas City is the largest city in the U.S. state of Missouri. According to the U.S. Census Bureau, the city had an estimated population of 488,943 in 2017, making it the 37th largest city by population in the United States. It is the central city of the Kansas City metropolitan area, which straddles the Kansas–Missouri border. Kansas City was founded in the 1830s as a Missouri River port at its confluence with the Kansas River coming in from the west. On June 1, 1850 the town of Kansas was incorporated; shortly after came the establishment of the Kansas Territory. Confusion between the two ensued and the name Kansas City was assigned to distinguish them soon after. In July 2005, the Kansas City Area Transportation Authority (KCATA) launched Kansas City's first bus rapid transit line, the Metro Area Express (MAX), which links the River Market, Downtown, Union Station, Crown Center and the Country Club Plaza. The KCATA continues to expand MAX with additional routes on Prospect Ave, Troost Ave, and Independence Ave.
On November 7, 2017, Kansas City, Missouri voters overwhelmingly approved a new single terminal at Kansas City International Airport by a 75% to 25% margin. The new single terminal will replace the three existing "Clover Leafs" at KCI Airport and is expected to open in 2021. Kansas City lies in the Midwestern United States, near the geographic center of the country, at the confluence of the Missouri and Kansas rivers. The city lies in the northern periphery of the humid subtropical zone. but is interchangeable with the humid continental climate due to roughly 104 air frosts on average per annum. 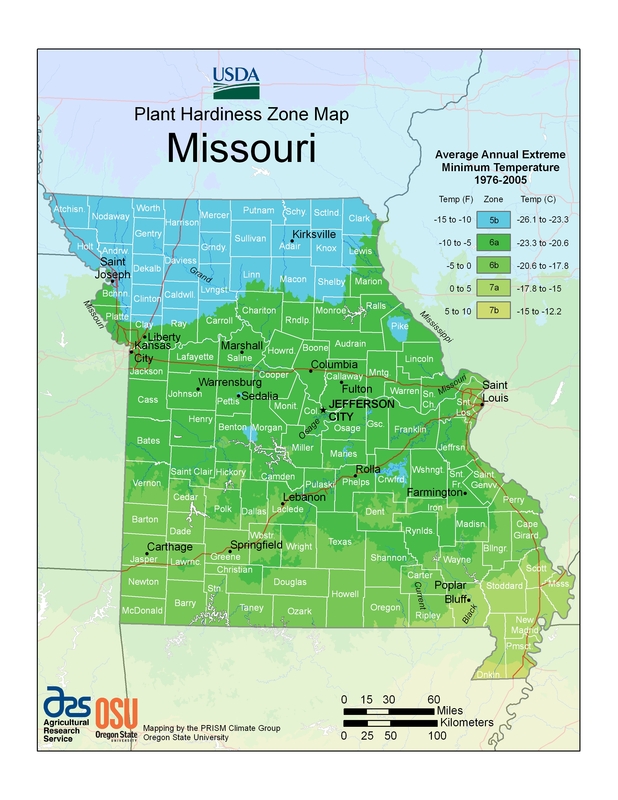 The city is part of USDA plant hardiness zones 5b and 6a. In the center of North America, far removed from a significant body of water, there is significant potential for extreme hot and cold swings throughout the year. The warmest month is July, with a 24-hour average temperature of 81.0 °F (27.2 °C). The summer months are hot and humid, with moist air riding up from the Gulf of Mexico, and high temperatures surpass 100 °F (38 °C) on 5.6 days of the year, and 90 °F (32 °C) on 47 days. The coldest month of the year is January, with an average temperature of 31.0 °F (−0.6 °C). Winters are cold, with 22 days where the high temperature is at or below 32.0 °F (0.0 °C) and 2.5 nights with a low at or below 0 °F (−18 °C). The official record highest temperature is 113 °F (45 °C), set on August 14, 1936 at Downtown Airport, while the official record lowest is −23 °F (−31 °C), set on December 22 and 23, 1989. Normal seasonal snowfall is 13.4 inches (34 cm) at Downtown Airport and 18.8 in (48 cm) at Kansas City International Airport. The average window for freezing temperatures is October 31 to April 4, while for measurable (0.1 in or 0.25 cm) snowfall, it is November 27 to March 16 as measured at Kansas City International Airport. Precipitation, both in frequency and total accumulation, shows a marked uptick in late spring and summer. Kansas City is located in "Tornado Alley", a broad region where cold air from the Rocky Mountains in Canada collides with warm air from the Gulf of Mexico, leading to the formation of powerful storms, especially during the spring. The Kansas City metropolitan area has experienced several significant outbreaks of tornadoes in the past, including the Ruskin Heights tornado in 1957 and the May 2003 tornado outbreak sequence. The region can also experience ice storms during the winter months, such as the 2002 ice storm during which hundreds of thousands of residents lost power for days and (in some cases) weeks. Kansas City and its outlying areas are also subject to flooding, including the Great Floods of 1951 and 1993. Ford Motor Company operates a large manufacturing facility in Claycomo at the Ford Kansas City Assembly Plant, which builds the Ford F-150. The General Motors Fairfax Assembly Plant is in adjacent Kansas City, Kansas. Smith Electric Vehicles builds electric vehicles in the former TWA/American Airlines overhaul facility at Kansas City International Airport. Classic Kansas City-style barbecue was an inner-city phenomenon that evolved from the pit of Henry Perry from Memphis in the early 20th century and blossomed in the 18th and Vine neighborhood. Arthur Bryant's took over the Perry restaurant and added molasses to sweeten the recipe. In 1946 one of Perry's cooks opened Gates and Sons Bar-B-Q. The Gates recipe added even more molasses. Bryant's and Gates are the two definitive Kansas City barbecue restaurants. Both have only recently begun expanding outside of Kansas City. Fiorella's Jack Stack Barbecue is also well regarded. In 1977, Rich Davis, a psychiatrist, test-marketed his own concoction called K.C. Soul Style Barbecue Sauce. He renamed it KC Masterpiece, and in 1986, he sold the recipe to the Kingsford division of Clorox. Davis retained rights to operate restaurants using the name and sauce. In 2009, Kansas City appeared on Newsmax magazine's list of the "Top 25 Most Uniquely American Cities and Towns," a piece written by CBS News travel editor Peter Greenberg. In determining his ranking, Greenberg cited the city's barbecue, among other factors. The Kansas City T-Bones, playing in the independent Northern League from 2003 until 2010, and currently in the independent American Association since 2011, and unaffiliated minor league team. They play their games in CommunityAmerica Ballpark in Kansas City, Kansas. Kansas City was also represented in the National Basketball Association by the Kansas City Kings (called the Kansas City-Omaha Kings from 1972 to 1975), when the former Cincinnati Royals moved to the Midwest. The team left Sacramento in 1985. In 1974, the National Hockey League placed an expansion team in Kansas City called the Kansas City Scouts. The team moved to Denver in 1976, and today they are known as the New Jersey Devils. 1 2 "US Gazetteer files 2010". United States Census Bureau. Archived from the original on January 24, 2012. Retrieved July 8, 2012. 1 2 "City and Town Population Totals: 2010-2017". Retrieved May 26, 2018. ↑ "City and Town Population Totals: 2010-2017". www.census.gov. Retrieved May 26, 2018. ↑ National Park Service (July 9, 2010). "National Register Information System". National Register of Historic Places. National Park Service. ↑ "Why is Kansas City located in Missouri instead of Kansas?". Archived from the original on July 16, 2010. Retrieved January 2, 2010. ↑ "Early City Limits". Archived from the original on September 27, 2007. Retrieved September 11, 2006. 1 2 3 4 5 6 "Missouri – Race and Hispanic Origin for Selected Cities and Other Places: Earliest Census to 1990". U.S. Census Bureau. Archived from the original on August 6, 2012. Retrieved December 18, 2011. ↑ "Historic Sanborn Maps of Kansas City". University of Missouri Digital Library. Retrieved March 21, 2011. ↑ Lawrence H. Larsen and Nancy J. Hulston (2013). Pendergast!. University of Missouri Press. p. xi. 1 2 "Kansas City (city), Missouri". State & County QuickFacts. U.S. Census Bureau. Archived from the original on April 23, 2012. Retrieved April 20, 2012. ↑ "Voter OK of arena tax 'changes everything' - Kansas City Business Journal". www.bizjournals.com. Retrieved 30 March 2018. ↑ "Iconic Kansas City Venue Named Hy-Vee Arena - Company - Hy-Vee - Your employee-owned grocery store". www.hy-vee.com. ↑ "For some on the KC council, patience on the convention hotel is wearing thin". kansascity. Retrieved November 20, 2017. 1 2 "Three projects are part of a surge in downtown KC apartments". kansascity. Retrieved November 20, 2017. ↑ "Source of Metro Employment Growth Shifting East?". kceconomy. October 5, 2017. Retrieved November 20, 2017. ↑ Authority, Kansas City Area Transportation. "Prospect MAX | Transit Initiatives | KCATA". www.kcata.org. Retrieved November 20, 2017. ↑ Morris, Mark (December 24, 2013). "Missouri Supreme Court all but ends battle over KC streetcar financing". The Kansas City Star. Retrieved July 29, 2016. ↑ "Midtown/UMKC Streetcar Extension Resources – KCRTA". kcrta.org. Retrieved November 20, 2017. ↑ "The Kansas City Star". account.kansascity.com. Retrieved November 20, 2017. ↑ Archived March 25, 2009, at the Wayback Machine. 1 2 "Historic City Market :: City Market Kansas City". thecitymarket.org. ↑ "Kansas City – Restaurants – Restaurant Guide". Archived from the original on May 9, 2008. ↑ Garvin, Alexander (2002). The American City: What Works, what doesn't. New York: McGraw-Hill Professional. pp. 119–125. ISBN 0-07-137367-5. ↑ Center, Sprint. "Sprint Center Announces Grand Opening Week Festivities - Sprint Center". www.sprintcenter.com. ↑ "Kansas City Missouri Climate Summary". Weatherbase. Retrieved February 3, 2015. ↑ "Kansas City, Missouri, Temperature Averages". Weatherbase. Retrieved February 3, 2015. ↑ "Archived copy". Archived from the original on February 24, 2014. Retrieved June 28, 2013. 1 2 3 "NowData – NOAA Online Weather Data". National Oceanic and Atmospheric Administration. Retrieved December 17, 2011. ↑ "Interpretation Of Skew-T Indices". Theweatherprediction.com. Retrieved July 10, 2013. ↑ Kansas City Tornado Almanac Archived August 24, 2002, at Archive.is, wdaftv4.com. Retrieved September 2006. ↑ KC powerless as icy barrage pummels the area, leaves behind disaster zone. Retrieved September 10, 2006. 1 2 "NowData – NOAA Online Weather Data". National Oceanic and Atmospheric Administration. Retrieved 2016-04-19. ↑ "Station Name: MO KANSAS CITY DOWNTOWN AP". National Oceanic and Atmospheric Administration. Retrieved 2014-03-13. ↑ "Kansas City Daily Climate Records/Normals". National Oceanic and Atmospheric Administration. Retrieved February 12, 2011. ↑ "Station Name: MO KANSAS CITY INTL AP". National Oceanic and Atmospheric Administration. Retrieved 2014-03-26. ↑ "WMO Climate Normals for KANSAS CITY/INTL ARPT MO 1961–1990". National Oceanic and Atmospheric Administration. Retrieved 2014-03-11. ↑ "Census of Population and Housing". Census.gov. Retrieved June 4, 2016. ↑ "2000-2010 Population Change Map" (PDF). Mid-America Regional Council. Archived from the original (PDF) on June 3, 2011. Retrieved September 2, 2013. ↑ "Archived copy". Archived from the original on May 20, 2012. Retrieved May 5, 2012. ↑ "2012 Instruction 1099-GENERAL" (PDF). Archived from the original (PDF) on March 15, 2015. Retrieved May 5, 2012. ↑ Kansas City Business Journal (July 19, 2006). "Bizjournals.com". Bizjournals.com. Retrieved May 5, 2012. ↑ "Facts About Our Region". SSA.gov. Retrieved May 5, 2012. ↑ "Post Office Location – Kansas City Archived July 24, 2012, at Archive.is." United States Postal Service. Retrieved on May 5, 2009. ↑ "U.S. Manufacturing Sheet – sanofi-aventis.us – Retrieved August 25, 2008". Sanofi-aventis.us. Archived from the original on July 26, 2010. Retrieved May 5, 2012. ↑ Kansas City Star – Kansas Tops List for Biodefense Lab Archived December 7, 2008, at the Wayback Machine. ↑ A Foregone Conclusion: The Founding of the Federal Reserve Bank of St. Louis by James Neal Primm – stlouisfed.org – Retrieved January 1, 2007. ↑ "The Role of Metro Areas in the U.S. Economy" (PDF). U.S. Conference of Mayors. March 2006. p. 119. Archived from the original (PDF) on December 16, 2009. Retrieved December 26, 2009. ↑ Roberts, Rob." KC ranks among best places to own rental property." Kansas City Business Journal. February 2, 2014. ↑ "Comprehensive annual Report" (PDF). Data.kcmo.org. Retrieved July 29, 2016. ↑ "Kansas City Chorale : Homepage". KCchorale.org. Retrieved May 5, 2012. ↑ "The Pitch, ''Best of 2007'': "Best Festival" – Kansas City's Blues and Jazz Festival". Pitch.com. Archived from the original on July 15, 2011. Retrieved May 5, 2012. ↑ Wankum, Leah (March 27, 2018). "Investing in the arts earns KC designation as UNESCO's only 'City of Music' in US". Startland News. Retrieved April 16, 2018. ↑ "Kansas City, MO Population and Races". Usa.com. Retrieved July 29, 2016. ↑ O'Laughlin, Michael. Missouri Irish, The Original History of the Irish in Missouri, including St. Louis, Kansas City and Trails West. Retrieved November 21, 2014. ↑ "Missouri Gaming Commission: ''The History of Riverboat Gambling in Missouri''". Mgc.dps.mo.gov. July 1, 1994. Retrieved May 5, 2012. ↑ The Kansas City Star, June 13, 2008: Missouri riverboat casinos' revenue increases in May. ↑ "Experience Kansas City – Barbeque Kansas City Style". Experiencekc.com. Retrieved March 16, 2010. ↑ Greenberg, Peter. "Newsmax Magazine Rates the Top 25 Most Uniquely American Cities And Towns". Retrieved January 16, 2014. ↑ "KC Council to consider $27 million in public improvements for 18th and Vine". kansascity. Retrieved May 8, 2016. ↑ "Starlight Theatre Attractions - KCparks.org". kcparks.org. Retrieved May 8, 2016. ↑ "Religion in Kansas City Metro Area, Missouri". bestplaces.net. ↑ "Disney, Walt, House and Garage" (PDF). dnr.mo.gov. ↑ Parks & Recreation, 2008 Reference Book Archived March 25, 2009, at the Wayback Machine. ↑ Parks & Recreation, About Parks & Recreation Archived November 21, 2008, at the Wayback Machine. ↑ TimeLine 150 Archived November 20, 2008, at the Wayback Machine. ↑ Focus Kansas City, Tri-Blenheim Neighbors United, report date: April 29, 2000 Archived March 25, 2009, at the Wayback Machine. ↑ "FBI: Violent crime drops in Kansas City for first half of 2012 - Kansas City Business Journal". Bizjournals.com. February 1, 2013. Retrieved July 10, 2013. ↑ "Powered prohibited Mirror". thinkdowntownkc.com. Archived from the original on December 22, 2008. ↑ Downtown News Archived April 12, 2008, at the Wayback Machine. ↑ "Article". www.bizjournals.com. Retrieved October 27, 2017. ↑ "Gisweb.kcmo.org". Gisweb.kcmo.org. Archived from the original on February 16, 2012. Retrieved May 5, 2012. ↑ "The Call". Kccall.com. Retrieved May 5, 2012. ↑ "The Ink". Inkkc.com. Retrieved May 5, 2012. ↑ "TV by the Numbers, ''Nielsen People Meter Markets'', November 6, 2007: "Rank, Designated Market Area, Homes"". Tvbythenumbers.com. Retrieved May 5, 2012. ↑ Monreal, Jane (April 2, 2016). "Tax breaks for films could bring cash to Kansas City". KSHB. Archived from the original on April 17, 2016. Retrieved May 9, 2016. ↑ "1998 Sprawl Report- Sprawl – Sierra Club". Sierraclub.org. Retrieved May 5, 2012. ↑ Kcsmartport.com Archived March 25, 2009, at the Wayback Machine. ↑ "Maps and Schedules". KCATA. Retrieved March 16, 2010. ↑ "Light Rail and MAX". KCATA. Retrieved March 16, 2010. ↑ Authority, Kansas City Area Transportation. "Prospect Ave. MAX | Light Rail and MAX | KCATA". www.kcata.org. Retrieved May 9, 2016. ↑ "Kansas City voters approve streetcar plan". Kansas City Business Journal. Retrieved January 26, 2013. ↑ "Crowds jam streetcars in Kansas City return". kansascity. Retrieved May 7, 2016. ↑ "Kansas City streetcar rides will be free". Kansas City Business Journal. Retrieved January 26, 2013. ↑ Authority, Kansas City Area Transportation. "Ride KC: Bridj Begins Service March 7 | News | KCATA". www.kcata.org. Retrieved May 9, 2016. ↑ "2015 City and Neighborhood Rankings". Walk Score. 2015. Retrieved August 24, 2015. ↑ "Kansas City neighborhoods on Walk Score". Walk Score. Retrieved May 9, 2016. ↑ "Kansas City Sister Cities". kcsistercities.org. Sister City Association of Kansas City, MO. 2014. Archived from the original on October 9, 2014. Retrieved November 17, 2014.